My beautiful little girl died at home on Easter Saturday morning. Ebony was a RSPCA rescue dog. Ebony chose us. Terry my spouse at the time, were delighted to have her in our lives. She was around 8 months old back on 9 April 1998. Ebony was with Terry when he died suddenly of a heart attack in February 1999. She was an example of unconditional love. We had a deep bond. I am glad you are no longer in pain but I do miss you very much. I hope we meet up in heaven. You are my best friend and I am lost without you. I see you in the corner of my eye but realise you are not there. 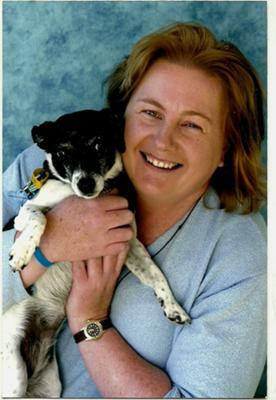 I will dedicate this years 5 Km Million Paws Walk and the following to you my darling Ebony. I will always love you. Ebony was a Mini Foxie Cross Jack Russell, so she was not completely black but I wanted to call a dog by that name. So people would sing the song Ebony and Ivory. You are my sunshine, so when I look up to sky I will see you.